Research just published on the current Denby Dale Passivhaus project in West Yorkshire has illustrated some serious flaws in the energy calculations used for Code for Sustainable Homes (CSH). The academic report, undertaken by Jim Parker, CSH Assessor and consultant at 1st Base Projects, includes an energy CSH assessment of the Denby Dale Passivhaus house and has concluded that “a Passivhaus dwelling’s energy savings are not realistically represented by its Code for Sustainable Homes ratings”.The research found that the Denby Dale Passivhaus, currently being constructed by Green Building Store’s construction division, would only meet CSH level 3 criteria for Ene 1: Dwelling Emission Rate 1, the mandatory aspect of the Code’s Energy Catagory despite its being projected to be one of the most energy-efficient buildings in the UK. As the rating achieved in Ene 1 puts a constraint on the overall score, the building could not achieve higher than a level 3 rating regardless of its performance in other areas. All buildings meeting the strict Passivhaus standards have to have space heating requirements of less than 15 kWh/m2/year, and use up to 90% less energy to heat than standard UK homes, often requiring minimal or no heating. In addition, airtightness for Passivhaus buildings, such as that at Denby Dale, is required to be no more than 0.6 air changes at 50 Pascals. The report suggests that the disparities between the Code’s approach and the Passivhaus standard in relation to energy are based on a number of factors, most notably limitations in the methodology of the current Standard Assessment procedure (SAP). Parker concluded that “The analysis of the SAP 2005 results show that Passivhaus dwellings could perform even better than this if SAP 2005 3 accurately estimated the carbon dioxide emissions of low energy housing.” This is partly due to the inaccurate CO2 emission factors attributed to fuels in SAP 2005. This is particularly significant when using electric heating. The low emission factor used for electricity means that higher Code ratings can be achieved by specifying systems with much higher actual emissions than their gas equivalents. The results also support the findings of earlier research commissioned by the AECB into the differences between the Passivhaus Planning Package PHPP and the Standard Assessment Procedure (SAP 2005) 4. This study found that SAP made many assumptions that resulted in a less accurate model for low energy buildings and that inefficient practices are assumed in terms of internal gains, ultimately resulting in an under estimation of heating requirement. Findings indicate that SAP does not allow for detailed analysis of solar and incidental gains, the effects of thermal mass and efficient electrical use. Bill Butcher, Director of Green Building Store commented: “Jim Parker’s research has confirmed what we have all suspected about CSH for some time. While we applaud the general approach of CSH in getting the construction industry to think about sustainability issues, we believe that it urgently needs to be revised to accommodate Passivhaus approaches more accurately. We would like CSH to get rid of SAP and incorporate the much more accurate Passivhaus Planning Package (PHPP) as its energy calculation methodology“. 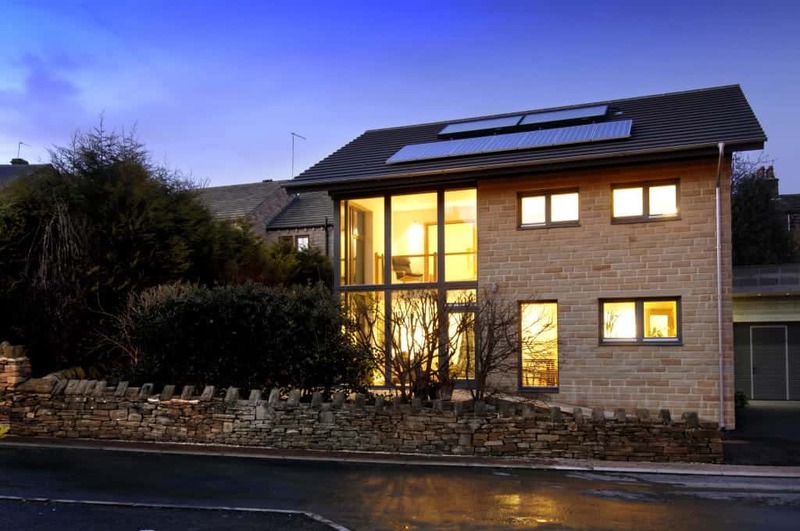 Green Building Store will be seeking to get the Denby Dale Passivhaus reassessed for CSH Ene 1: Dwelling Emission Rate, when SAP 2009 has been finalised. It hopes that SAP 2009 will be a more accurate tool and may more accurately assess the energy use of truly low energy Passivhaus buildings. The percentage improvement of the DER over the TER is 41.29% which is equivalent to Level 3 of the Code and gains 7 credits. Level 4 of the Code requires a 44% improvement. * It was not possible to undertake a full CSH assessment of the Denby Dale Passivhaus, due to budgetary constraints, however, the mandatory energy results illustrate that it could have received no more than a Level 3 overall rating, using current SAP 2005 methodology. o Lighthouse data was sourced from: Lighthouse brochure, available at: www.kingspanlighthouse.com. Space heating value provided was calculated using an adapted version of SAP. Accessed November 2008.
o Old Apple Store and Norbury Court data was sourced from: The Code for Sustainable Homes: Case Studies. Available at: www.communities.gov.uk/publications/planningandbuilding/codecasestudies. Accessed March 2009.
o Denby Dale design figures calculated using Passivhaus Planning Package (PHPP) software 2009. 3. SAP 2009 is currently out for consultation and will replace SAP 2005 in 2010. There are some changes to the methodology due to take place, including a possible revision in the assumed CO2 emissions per kWh of fuel used. It is possible that these changes would affect the Energy rating for the Denby Dale house. Source: ‘Passivhaus in the context of the Code for Sustainable Homes’ (dissertation submitted in partial fulfilment of the requirements of MSc Sustainable architecture, University of Huddersfield) by J.M Parker, CSH Assessor and Director 1st Base Projects .The full report is available from Green Building Store.